Mistral: Bonjour Gérard, what was your first thought when you learned about our Catherine de Montsalvy Website? Gérard: first of all, it seems so far in the past, that I feel like an ancient knight in his armour, in front of a computer!! Mistral: Do you remember how you got your role as " Chevalier Jean de Xaintrailles" playing the hero's (Arnaud de Montsalvy) best friend and one of Jeanne d'Arc's most faithful captain's in "Catherine, Il suffit d'un amour"? Gérard: In fact it was the second time I worked with Marion (Marianne) She just asked me to ride, and being able to gallop (in my armour) saying my text! Mistral: Now that many years have gone by, do you remember what your feelings were, partaking in that most awaited tv-production directed by Marion Sarraut - after the besteller "Catherine" by the author Juliette Benzoni? Gérard: It was like an adventure with a time machine, wearing armour, living in castle's and riding horses all day long. (Duke Philippe) Isabelle Guiard (Jeanne d'Arc) or Geneviève Casile (Queen Yolande) to mention only a few? Mistral: Do you remember the reaction of the public, press and critic - after Marion Sarraut's tv-production which consisted of sixty episodes (each 25 minutes long) aired on March 1986? Gérard: I think we had a very good audience. During that time, while on screen, a lot of people looked at me and said: "oh look, it is Xaintrailles, how are you?" That was very friendly. Mistral: You participated in three out of four Marion Sarraut's tv-series, adapted by Juliette Benzoni's bestellers. If you had a wish free, which of the three characters would you like to be for a day? Mistral: Did you ever have the chance to meet your colleaques from that period again? Be it in a film, play or tv-series? Mistral: In your long career, you acted in many tv-productions and international movies. You became a fantastic well known singer of chansons, musicals, rock operas and poet writer. Directed two operas you had written yourself. Is there still a part you wished to play and have never been asked or there was never the right moment for it? Gérard: I would love to play the part of Jacques Brel in the future "life of Jacques Brel"
Mistral: During your concerts, you have travelled to many exciting places in the world - like Russia, Morocco, Spain, Jordan, Syria and as far as China. What kind of memories did you bring back home to your native France? Gérard: The very simple idea, that men and women all over the world - are looking for peace and happiness. Discovering that the best way to share simple feelings and fraternity - are in songs. or in a new musical? Gérard: As you know, I am in the musical "Don Quichotte Jacques Brel" which I wrote. When we come back from Syria, we will perform next in Morocco and I hope to find a theater in Paris for the next season...perhaps a theater in Switzerland?? Gérard Chambre has done us the great honor to give us our first exclusive interview. For a small fansite like ours, this was an extraordinary unbelievable moment. We thank him for the trust he put in us - especially for that reason! 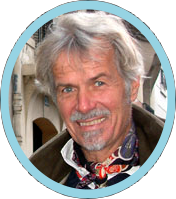 We would like to give our sincere thanks and gratitude to Gérard, who played Jean de Xaintrailles in our beloved series " Catherine de Montsalvy" and send him our best wishes for all his projects now and in the future.